Enjoy Stand Up Paddle Boards for rent at all lakes, reservoirs, and rivers in the Western States. All of our locations require you to rent watercraft in order to rent the paddle boards. This is one of the fast growing sports; the stand up paddleboard rentals are some times referred to as (SUP) which is a fun for all ages, easy, and a great way to exercise and play on the water all at the same time! Paddleboards offer an amazing full body workout and is becoming a favorite cross-training activity for skiers, snowboarders and other athletes. It’s a unique experience standing on the water to see all types of fish and plant life under your feet; it’s almost like walking on water! 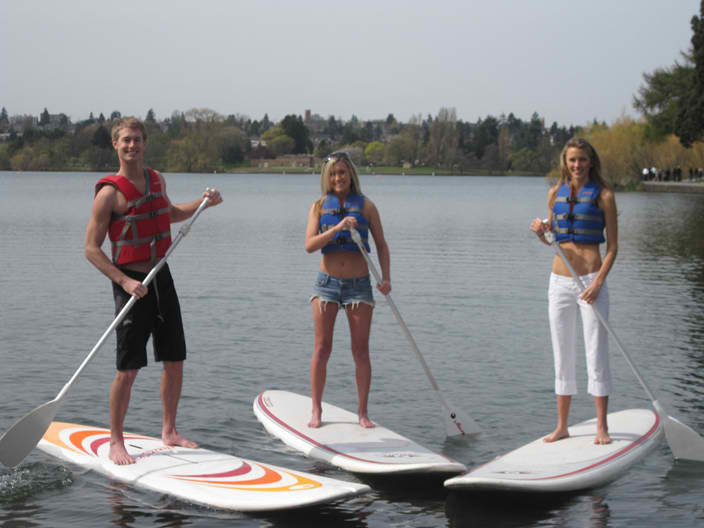 Rent one of our new Paddle Boards today! Beginner mistakes in paddle board rentals. These mistakes are easy to make when you’re starting out so try to avoid them and you’ll have a lot more fun on the water: A hunched posture is not good so keep your back straight, shoulders level. Staring at your feet instead of the horizon and elbow (bent angle) of the paddle facing in the wrong direction; It should point away from you. Having both hands on the paddle shaft with your top hand belonging at the very top of the paddle, on the grip. Finally do not stand straight-kneed; it is much easier to balance with bent knees. When you’re just starting out, it’s easier to kneel on the board rather than to stand directly upright. Standing alongside the board, place your paddle across the deck of the board and use it as an stabilizer. The paddle grip is on the rail (edge) of the board; the blade rests on the water. Hold the board by the rails. One hand will also be holding the paddle grip. Pop yourself onto the board into a kneeling position, just behind the center point of the board. From that kneeling position, get a feel for the balance point of the board. The nose shouldn’t pop up out of the water and the tail shouldn’t dig in and keep your hands on either side of the board to stabilize it. Once you’re ready, stand up on the board one foot at a time and place your feet where your knees were. To help you keep your balance as you stand upright on the paddleboard; your feet should be parallel, about hip-width distance apart, centered between the rails (board edges). Don’t stand on the rails and keep toes pointed forward, knees slightly bent and your back straight. Balance the board with your hips—not your head. Keep your head and shoulders steady and upright, and shift your weight by moving your hips. Your should be looking in front of you and avoid staring at the water or board.